Thin provisioning is the practice of passing logical unit number (LUN) sizes up to application servers without actually reserving the total physical capacity of those LUNs for data storage. Thin provisioning is a popular feature of IBM® XIV® Storage System. Data space reclamation helps you enjoy the benefits of thin provisioning. Space reclamation is a storage system function to reclaim a specific amount of disk space for general purpose use after being notified by the file system that the disk space was deleted at the host level. 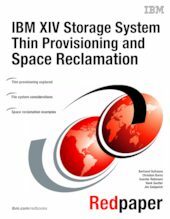 Because XIV thin provisioning and support for space reclamation are so tightly related, this IBM® Redpaper™ publication explores both concepts in detail. This publication is intended for system and storage administrators who want to take advantage of the XIV functionality in thin-provisioned environments, coupled with the latest space reclamation enhancements.